Recommended source for garden grade tulle and good shade cloth? We have most days in the summer at or above 95 degrees and a lot over 100. Last summer my garden made it through but I want to add shade cloth this year. What percentage sun block would be good to use and where is a good online source for it? I'm thinking of checking out a local Fruit Grower's Supply Store to see what they have. I went to Lowe's and Home Depot over the weekend and all they had was heavy duty shade cloth and nothing for the bug protection tulle. I'm outside of Fresno, CA for anyone local that might know of a good local resource. Re: Recommended source for garden grade tulle and good shade cloth? I'm not sure how much regular row cover stuff is (for insect protection) but I just buy the 108" tulle at Joann Fabric. There's almost always a 40% off coupon available in email or snail mail which brings it down to $1.80/yd. Hope that helps! When everyone talks about tulle, you all really mean tulle fabric. Here I was (dumb me) thinking it was a code word for some special garden fabric. There is a Joann's by my house (yay). Coelli is right: There are almost always 40% off coupons. An easy way to get one is to get on their e-mail list. Now about the shade cloth - I remember years ago Home Depot had varying % of blocking like maybe 30% sun blocked etc. Is there are recommended sunblocking % for growing full sun veggies but blocking the intensity of the sun here in the summer? Nice about the tulle gift. Tulle should be going on sale soon (wedding season) at places like Joann's Fabrics. Newbie question: Do you just use the tulle at night to keep away the bugs and take it off during the day to allow the bees to pollinate? I use the tulle all season on the brassicas. Also on the plants that need pollination, I will lift the netting for a few days, or maybe put a few bees under the netting. For shade cloth, I went to garage sales and thrift stores and bought curtain sheers. Don't know what the % is but I know my tomatoes appreciated them last year. For shade cloth I mostly use cheescloth purchased from Jo-Ann's. You can cover with one layer, two or even three if you like depending on how much shade you want. I've also used old sheer curtains I had packed away that I didn't think I'd ever use again. 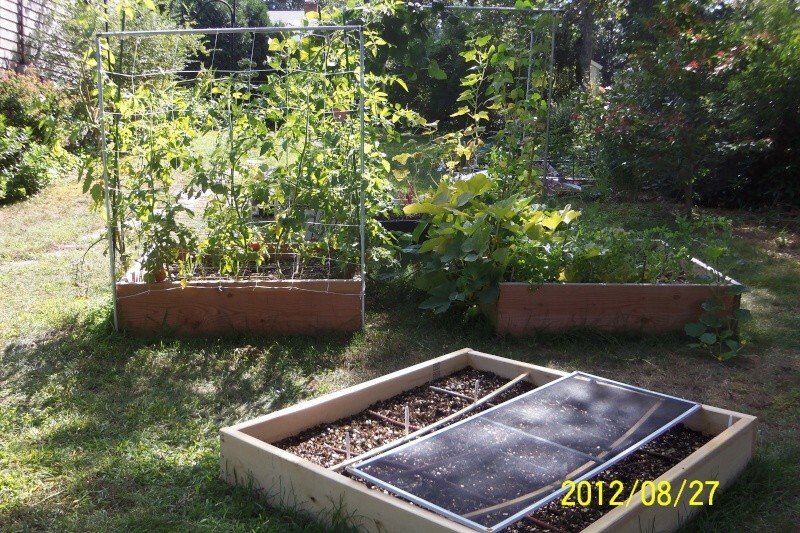 Another way to shade plants is to use old window screens or snow fencing (it has slats) so that as the sun moves across the sky, it shades different parts of the plants thru the slats. Even a sheet of plywood works to give dense shade. For insect protection light-weight row cover is made especially for the purpose. It, too, allows sunshine and rain to reach your plants. If a plant needs pollination, like strawberries, just toss the cover aside for a few days so the bees can do their thing. Cover at night against moths looking to lay eggs. 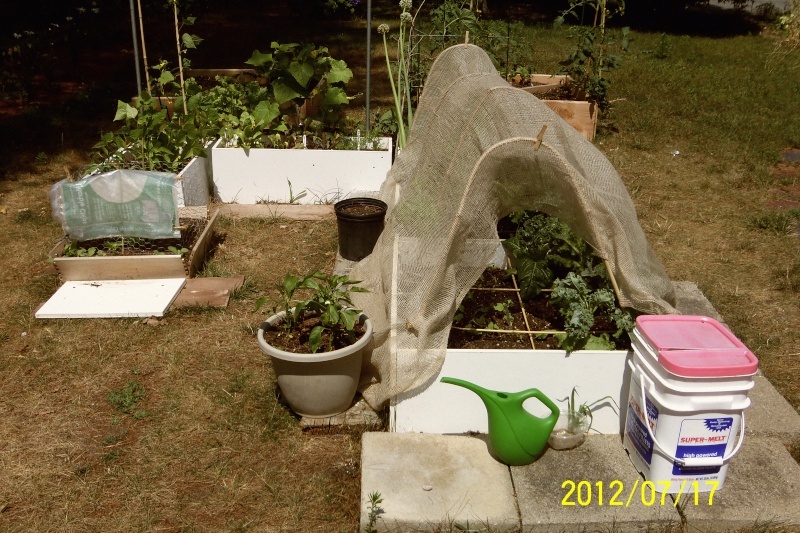 For things like broccoli, cauliflower, lettuces, greens, spinach that don't go to seed til the end of the season and don't need pollination during the growing season, you can keep the tulle or the row cover over the plants 24/7. I do have some old sheers in the closet, I'll give those a shot. After all I've spent this year for "FREE" veggies, my sweet hubby will be thrilled I'm reusing the old stuff, LOL! I use shade cloth in the summer. I water early in the morning, and after work. Without shade cloth, or a mid-day watering, my plants wilt. I've used both 30% and 50% shade cloth. I can't remember what site I ordered from, but I searched for the cheapest. I too need to prepare for the sun this coming summer. While investigating reasonably priced shade cloth, I found this website with knitted shade cloth! Some are coated with a reflective material. 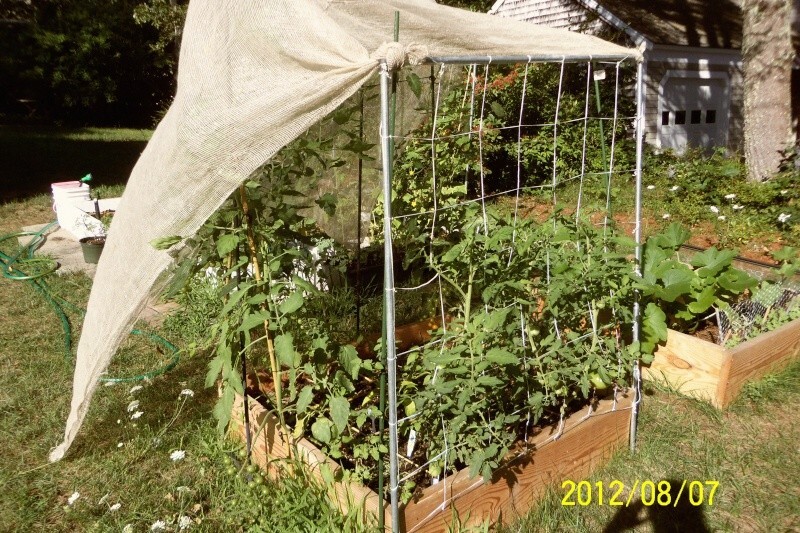 I used window/door screens or burlap for shade. The screens work well when something is just starting out and is still small. Apparently the burlap also kept out the cabbage moth as I didn't even know there was such a thing til I took it off. I found this thread again today. I missed a couple of the responses at the end. Thanks for the great information. My lettuce has gone bitter overnight (90+ degree days will do that :-( ) Literally the salad we had last night was the best ever and the salad at lunch about killed both of us, LOL! I'm pulling plants and planting under the larger plants that will shade them. 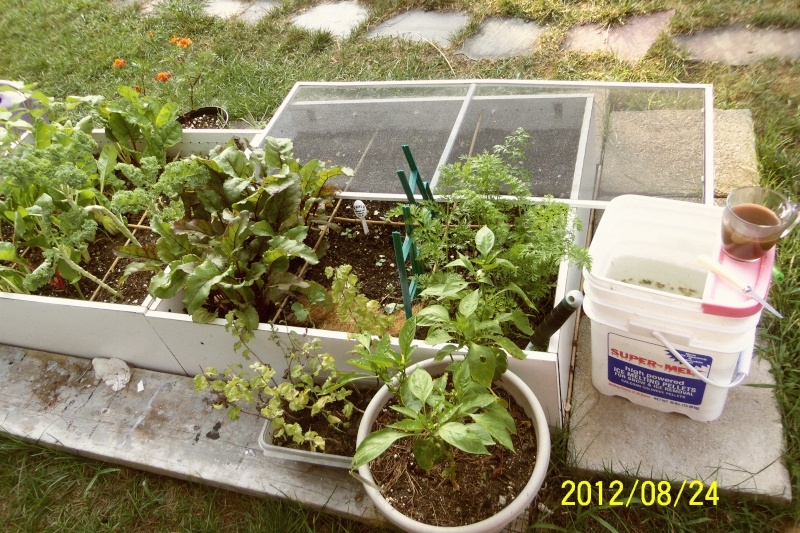 I'm going to work on planting some window boxes with lettuce on my front patio. It's on the north side and we're going to be adding a misting system. Looks like we'll be going pretty much straight to summer this year. Time to get ready for the misery!